My wife bought me a pair of Yak Trax for Christmas last year and I've been pretty happy with them in a number of situations. For those of you that have tried them what do you think? Interesting product. Sort of a "Crampons Lite." My wife jogs in those and has had her pair for 2 years. I cannot believe that they have stood up to that kind of abuse several days a week for all the cold months here in Montana, but they have. She loves them. I may have to get a pair for hiking now that you've planted that thought in my head. I've had a pair of Yak Trax for several years and I love them! They are awesome on ice and snow pack, they have never let me down. Ironically, having them on while walking on linoleum is like walking on ice. Hi Jason, Happy New Year! My wife an I have owned them for 5 years now. However, this being North Carolina we have only had the opportunity to use them one time. I like them but have not put them through enough use to really have an opinion on them yet. Maybe in the next 5 years I'll be able to form one for you. Nope. They work OK on the flats, but if you try and hike in them on ice/snow pack or irregular surfaces ( like real trail hiking) they roll off the footwear. Many of us use a product called Stabilicers up here where we just got 2 feet of snow on top of ice. Depends on what you want to use them for. Wow, that's pretty amazing. I only expect mine to last 2-3 seasons of light to moderate use but maybe I'll be pleasantly surprised. I haven't had any issues with them falling off. Are you sure they're the correct size? Maybe they're coming off because they're not tight enough. I love 'em, though I too had trouble with them popping off when climbing. I figure I should have bought the YakTrax Pros with the extra hold-on strap. Mine are a lovely fluorescent green so I can find them easily in the snow or my pack. And yes when you reach the linoleum of the grocery you will want them off. However I would also check out Kahtoola Microspikes and read sectionhiker.com's comments. Maybe it is a question of city streets versus rocky climbs. I have had them for about six weeks and have used them dozens of times in various conditions, including ice-covered sidewalks and streets, snowy trails, etc. They are great. I never slip, even walking a big rowdy dog quickly on an icy sidewalk. He slips instead of me! I have the Pro version with a velcro strap. There is no way they can come off accidentally. If they are sized right and put on correctly they are 100% reliable. I hope they work pretty good. I just ordered a pair for a trip to the Smokies at the end of the month. We are taking the Alum Cave Trail up to Mt LeConte, and then hiking for another 2 days so I will be depending on them! Thanks for the video though. I have read some bad things / problems about them, but your video gave me some hope! They look like they will be pretty good though, at least for a while. I don't think you'll have a problem with traction. My only concern is durability in the long run. But people seem to have mixed experiences there. We'll see. I think you won't have a problem for your trip though. Have fun man! Just found your blog. Great info. Really like the video on Event vs. Gore-Tex. 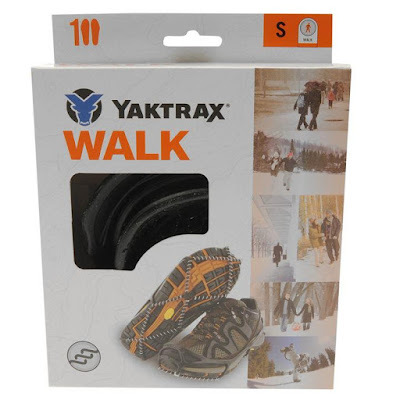 I have used Yaktrax and I think they are great for everyday light use but they do wear out and the rubber base that carries the coil breaks so I wouldn't want to rely on them for a major outing (without back-up). I got Katoohla microspikes this year and they are much more sturdy. The underneath is all metal and the upper part is stretchy substantial rubber. They have more bite in icy conditions and are less likely to slip off. They definitely cost more but I think the price is worth it. Welcome! I'm glad you enjoy the blog. I bought these for my Dad so he can hike up hill and dale in winter. He loves them, he finally wore them out this year, the rubber part gave up the ghost. So I asked if he wanted another pair or something different, He said the asame they work great. I have had my yak trax for several years and use them alot here in Michigan on the great Lake Superior. I have the ones that have the additional velcro strap over the foot to add support from rolling and such. never had a problem and no damage to them after about 5-6 yrs. I have a pair of knock-offs that I got for $5.00 after the rebate. They differ only slightly in the shape i.e. there is definitely a heel and toe to mine. I found that they did have a tendency to come off with any kind of side-to-side movement (I was shovelling snow). A couple cable ties and some latex tubing took care of that. I used it the same way that the Yak Trax Pro model have a velcro strap that goes over the top of your shoes/boots. I bought my Yaktrax online and I have had them for about 2 years! I would firmly stand behind them. My favorite thing about them is that they are lightweight and really easy to take on and off. I live in michigan and use mine to walk my dog in the morning, and I love them because I can still walk on non iced surfaces and not ruin the Yaktrax, as opposed to a cleat which gets destroyed if you walk on cement with them.